Catalan regional President Carles Puigdemont delivers a press conference before Catalonia's and the EU's flag. More than 2.25 million people turned out to the recent referendum across Catalonia, a region in the northeast of Spain. The regional government said 90% of voters were in favor of a split from Madrid. But the turnout was low, around 42% of the voter roll. Catalan authorities blamed the figure on the crackdown on the vote initiated by the national government. Spain’s highest court had ruled the vote illegal under the Spanish constitution. Citing the judicial authority, Madrid flooded Catalonia with thousands of national police in advance of the vote. Officers seized millions of ballot papers and sealed schools and other buildings to be used as polling stations. 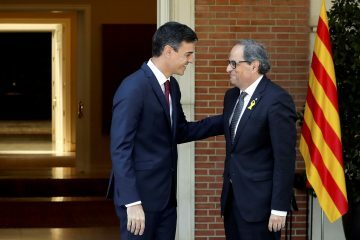 Although many both in Madrid and Barcelona are expecting a unilateral deceleration of independence by the Catalan government but things are still up in the air giving the fact that no road map for the coming weeks and months is set by the parties. In an interview with Vocal Europe, three influential voices of the European Parliament from Catalonia; namely Javi Lopez, Josep-Maria Terricabras, and María Teresa Gimenez Barbat expressed their opinions and concerns regarding the independence referendum of Catalonia and the way ahead. Vocal Europe: Are you surprised by the way how the independence referendum unfolded? Javi Lopez: Yes, of course. I think that nobody expected the images we unfortunately had to witness and that saddened us all. Josep-Maria Terricabras: Of course, I am. I would have never imagined that the Spanish police would act in such a restless manner. María Teresa Gimenez Barbat: The truth is that a minority of nationalists has taken the right to choose for the citizens of Catalonia. They have breached both the Spanish Constitution and the Rules of Procedures of the Catalan Parliament. Going back to your question, I would say that the nationalist framing has been nothing more than a romantic fairy-tale, based on emotion-driven politics and not the reality of events: “heroic people” from Catalonia has called for freedom against the villain Spanish authorities. Unfortunately this storytelling has partially worked, except for the fact that it does not correspond to what has really happened. 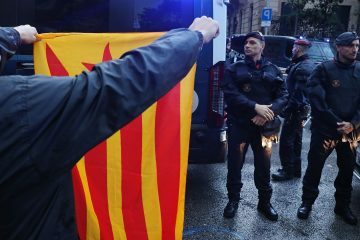 Vocal Europe: How is the atmosphere in Catalonia now? Javi Lopez: There is a wide consensus on the fact that the way the police intervention was developed in some cases was unacceptable and must not be seen ever again. Josep-Maria Terricabras: It’s not easy to answer this question, because I cannot describe the atmosphere in a single word. It is, at once, of sadness, (because of the violence employed, with so many injured people), of pride (because of the extraordinary peaceful reaction of hundreds of thousands of people), and of expectation (because we have an uncertain future in front of us). María Teresa Gimenez Barbat: The situation is very tense and it would be better for Catalonia, Spain and Europe to take a break and think about the future. All the parties must cool off or a dialogue would not be possible. The general strike and the accusations of an authoritarian outbreak do not help, but these acts are part of nationalists’ political strategy. They are pursuing an emotional approach that could be immediately profitable in terms of electoral consensus, but could also produce a disaster in the longer term. I think that a rational approach would produce a win-win situation. According to the “moral circle” of trust cooperation and solidarity theorized by many philosophers and humanists, over the course of centuries human beings have learned to protect their parents and their families. This behavior helped them to preserve their lives and their own genes. Over time, this circle became larger, encompassing not only family members but also other people which wanted to share the values of trust, solidarity and cooperation. This trend has been confirmed by Quincy Wright, a military historian. He noted that in the 15th century, more than 5000 independent entities were part of Europe, while in 1953 they were only 30. This positively affected the life of European countries, in fact, according to the Global Peace Index 15 out of the 25 most peaceful nations of the world are Europeans. Which is the lesson we can learn? Spain, Catalonia and the EU could enlarge the circle of trust, cooperation and solidarity to produce mutual benefit and continue the historical positive trend. Vocal Europe: What should we expect now following the referendum? Javi Lopez: I really hope that the governments of Spain and Catalonia finally sit, talk and negotiate a way out of this conflict in accordance to the rule of law, democracy and fundamental rights. Josep-Maria Terricabras: Those who are in favor of independence (I count myself among them) have no other possibility as going ahead with our project. The alternative would be to accept the total vengeance and humiliation by the Spanish authorities. María Teresa Gimenez Barbat: I hope that every party will act according to our Constitution, it already provides democratic tools to ensure a profitable dialogue among the players involved. As our Head of State, King Felipe VI, already mentioned, the Constitution protects both citizens’ freedoms and the sovereignty of Spain. He indicated the future path: the State will defend who has been harmed and will restore the legal order. Vocal Europe: The referendum was organized and presented by the government in Catalonia as a binding vote that could result in a unilateral declaration of independence. Do you think that this way of presenting the referendum was against the Spanish constitution as the Spanish government argues? Javi Lopez is a member of the European Parliament from Catalonia within the Socialists and Democrats Group. 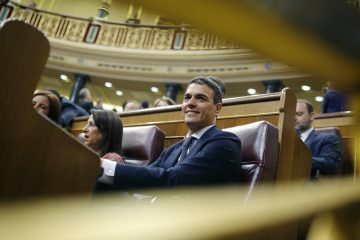 Javi Lopez: There is no doubt that this referendum was illegal, as it was repealed by the Constitutional Court and had no legal basis nor any tangible warranties. However, the response by the Spanish government has relied exclusively on judicial intervention, and that is not the most suitable or effective manner to deal with such a big political problem. Josep-Maria Terricabras: It was against no one. It was the only way we had to know the wish of Catalan people. The Spanish government discredited itself in not accepting a dialogue during the last years. Mr. Rajoy said, at least twice that I remember and that can be looked at in the archives, “I can’t and I don’t want”. We had no alternative. The most democratic way is to count us: how many are in favor, how many against. How can this be forbidden? How can this be against any law? María Teresa Gimenez Barbat: I think the most important opinion on the topic has been expressed by the Spanish Constitutional Tribunal. According to the Spanish Constitution, it is the only one authorized to rule on the constitutionality of laws, regulations and acts adopted by the national and the regional Parliaments. The “Tribunal Constitution” suspended the Self-Determination Referendum Act, and the Act on Legal Transition for the Founding of the Republic, but the government of the Generalitat continued its illegal path, ignoring court’s rulings. That being said I am also outraged facing the arrogance of Nationalists, not only they spread resentful and supremacist feelings, they also act against their Tribunal claiming that its judges acted conformingly to the decision of the Central government. This is a serious accusation from the nationalists and from who thinks that personal careers is more important than the future of Catalonia, Spain and Europe. 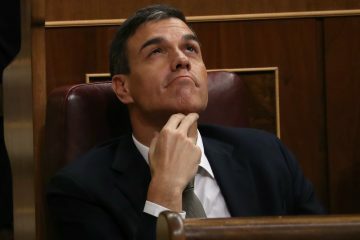 Vocal Europe: Do you think that the Spanish parliament in the foreseeable future is ever going to pass the legislation that makes such a referendum legal? Josep-Maria Terricabras: Not in the next one hundred years. They have a religious idea of the “unity of Spain”. PP is now defending a Constitution which it didn’t accept in 1978. María Teresa Gimenez Barbat: I think that would be a mistake. However, the situation is very tense now and things should de-escalate before thinking to any future legislation. In any case, I think that if any breach of the rule of law persists, the State will trigger article 155. Vocal Europe: Giving the fact that the European Commission stated that the referendum has no legal basis, what is your take on the EU’s stance vis-a-vis the referendum? Javi Lopez: The EU has done what was expected from it: defending the rule of law and the constitutional order of one of its member states. Had it done something different, it would have been an irresponsibility. Josep-Maria Terricabras: Of course it has legal basis! It has been said by more than 600 expert jurists. a) The Constitution does NOT forbid a referendum; b) The Spanish penal code had an article penalizing the call for a referendum. It was officially Deleted in 2005; c) Self-determination is a principle accepted by international laws, which have been accepted by Spain. Consequently, Spanish legislation has to apply those international laws and principles. María Teresa Gimenez Barbat is a member of the European Parliament within the Alliance of Liberals and Democrats for Europe. María Teresa Gimenez Barbat: I fully agree with this position. As it was reminded today by Vice president Frans Timmermans during the plenary debate on the situation in Catalonia, the respect of the rule of law is not optional, it is fundamental, and it is the most important common value for the EU member States; the Treaty on the European Union states that it shall respect the essential State functions, including ensuring the territorial integrity of the State, maintaining law and order and safeguarding national security. In particular, national security remains the sole responsibility of each Member State (art.4.2. and 4.3). Spain acted to protect its national integrity, the Judicial Power will decide whether its use of force was disproportionate and establish legal responsibilities. One of the conditions to be part of the EU is the respect of the rule of law, and Spain complies with this conditions since every person is subject to laws and courts’ rulings. Vocal Europe: Will we see this crisis de-escalating in the coming days and weeks? In that regard, do you see any chance of EU mediation between the both parties? Javi Lopez: I hope there will be a de-escalation of the tension in Catalonia and Spain and both parties will agree to a calm and poised dialogue, as it is the duty for any democratic public servant. We shall not expect the EU to mediate every time a member state faces an internal challenge. Josep-Maria Terricabras is a member of the European Parliament. He is also President of the European Free Alliance and first Vice-president of the Greens-EFA Group. © European Union 2016. 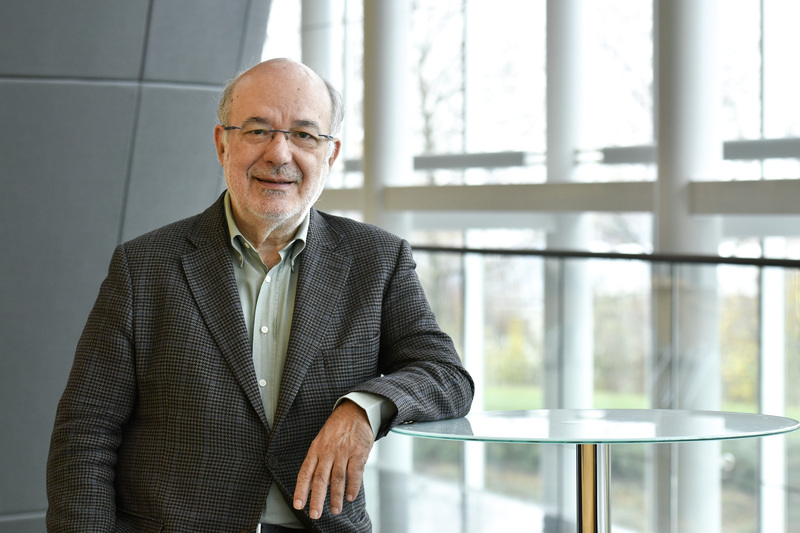 Josep-Maria Terricabras: I feel not able to make predictions about the future. I hope we will have some kind of mediation, but not immediately by the EU, which is extremely conservative and only jumps up at the very end, when everyone has already acted. 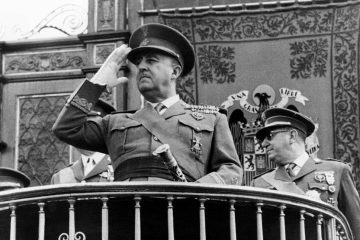 They still believe that democracy comes from law (Franco had also laws), instead of understanding that law comes from democracy, and democracy from the will of people. Also, they thing that mediation is something reserved to cases of misery and disaster (in their opinion, just useful in Africa or in underdeveloped countries). Spain doesn’t need mediation, doesn’t want it. Spain needs nothing. Reality and the Spanish banking system show the falsity of this, but they don’t care. Reality is always wrong if they decide so. It is precisely to oppose this odd and old conception of the world that the EU should act. A pity it doesn’t want. Probably it hasn’t still understood the problem. María Teresa Gimenez Barbat: For what concerns EU mediation, Treaties are unambiguous, the Union will respect State’s essential functions and its responsibility in safeguarding national security and integrity. King Felipe has been crystal clear about that, the Constitution of Spain attributes to the State all the necessary means to enforce the Rule of Law. I strongly hope that these will not be used, but the Generalitat should step back.